Back painted glass tiles on the backsplash and frosted hood panels that light up add sparkle to the kitchen. A soffit helps delineate the cooking area in the open kitchen, while the curved counter creates a nook for the breakfast area. Removing a second staircase made room for the pantry. The kitchen’s honed black-granite countertops recede, making the Carrara marble-topped island the focal point. The new butler’s pantry is designed in 1920s style, with open shelving, a beadboard ceiling, and a gathered linen skirt at the sink. Ceiling coffers with beams define an otherwise open layout; larger panels above the dining table contrast with smaller compartments elsewhere. Glass-front cabinets help keep the kitchen feeling airy, while honed granite counters provide a work surface. Large pendant lights loom over the vast kitchen island. The floors throughout the house are white oak with an ebony stain. A dressy chandelier in the kitchen? Why not? "I’m all about mixing it up-formal with informal, high with low," says homeowner/designer Olga Adler. The refrigerator, pantry, and other utilitarian elements are stowed behind the kitchen’s tiled wall. The peninsula, which claims the spot where a wall once stood, is clad in paneling recast from salvaged doors. Daniel Tousignant painted the clouds above the hearth. as well as the landscape mounted above the old-fashioned phone. The open-plan kitchen boasts custom-made striated ash veneer cabinets and a walnut-topped granite island. The sophisticated kitchen sports a skyline marble mosaic backsplash and a mix of painted and stainless-steel cabinets. Arctic Pear light fixtures by Ochre gleam above an island of snow-white quartz. Rebuilding the rear brick wall gave the design team the chance to add large windows to the spacious kitchen, a cook’s dream with its horizontal-grain walnut cabinets and stainless-steel counters and appliances. The kitchen is outfitted in butternut wood cabinetry and millwork. The classic white kitchen was given contemporary touches such as the cabinet hardware, light fixtures, and bar stools. A slab from the trunk of a walnut tree makes a floating table in the kitchen’s bright, cozy nook. The kitchen is as well-loved as it is often-used, with plenty of room at the long walnut table for sit-down dinners with family and friends, stainless-steel appliances and accents, and a large island of steel, wood, and concrete-material choices used throughout the house. As a central workspace and gathering spot, the kitchen had to be user-friendly and functional. "We spent an incredible amount of time figuring out flow," remembers the homeowner. Lots of drawers were a must, and the countertops are fabricated from attractive, yet durable, white Caesarstone. New flooring and cabinetry give the kitchen a fresh look. The designer is drawn to unusual art. Disorientalism: Ready Mix tells the story of Aunt Jemima’s makeover "from slave mammy to modern working mother," part of a series from Asian-American artists Katherine Behar and Marianna M. Kim. In the cozy country kitchen, the peninsula is supported by a reclaimed wood post and surrounded by industrial-inspired stools. The Clive Christian kitchen plays with rich detailing in the cabinetry and turned legs of the island and range area. Rinfret accented the space with an iron chandelier and wallpaper. Brushed-aluminum upper cabinets add a modern touch to the kitchen, while the glass tile backsplash brings a spark of energy. A range and hood with an industrial look make it clear this is a kitchen for a couple who love to cook. The room’s plentiful natural light is further enhanced by pale cabinetry and a glass mosaic backsplash. The kitchen has a definite Euro-modern vibe. The spacious kitchen sports marble countertops and a custom dining table in a boat shape. Rogers accentuated the ceiling beams in the kitchen by painting the walls chocolate brown. The summery blue of the Moroccan tile backsplash was the starting point for the kitchen’s design. The kitchen island can serve as a second dining table or as a buffet. The modern lines of the cabinetry, shelving, lighting, and hardware complement the rustic elements found in the wood beams and textured ceramic floors. The kitchen received a new, modern look with a -layout designed to accommodate two cooks. 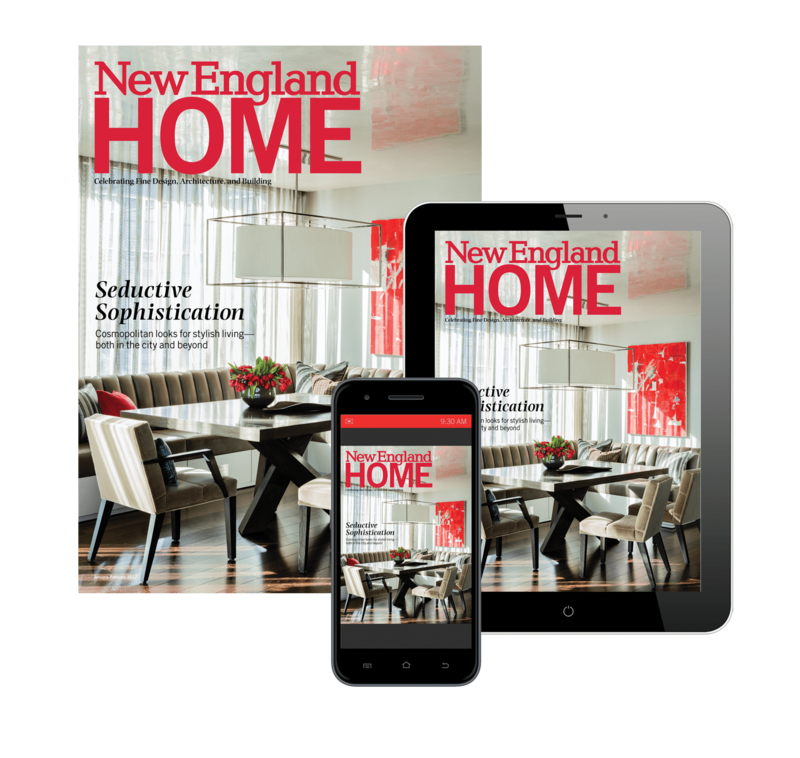 In the kitchen, everyone’s favorite gathering spot, traditional millwork and more modern furniture make happy companions. The out-of-date kitchen has been replaced with a bright and efficient space with a tiled back-splash, classic cabinetry, and limestone floor that fit right in with the home’s traditional style. The kitchen’s custom-painted fixture is by Stray Dog Designs. "I like oversize lighting," says Goldberg. "This one complements the grand scale of the table." The zippy indoor/outdoor fabric on the dining chairs is Tortola by Schumacher. New countertops and snowy tiles give the busy cooking zone fresh spirit. The one-of-a-kind backsplash is a mural by island artist Kara Taylor. In the office just off the dining room, designers O’Kelly and Georgopolis opted for a green ceiling to define the architecture of the space while creating a sense of coziness. The design team created a spacious new kitchen, complete with an island and breakfast counter. New cabinets of white wood and glass and a copper oven hood blend in with period elements such as the original leaded-glass doors. Black steel ceiling beams help to define interior spaces. The sunny kitchen serves up a bounty of storage, with upper and lower cabinets and niches in the island. For snacks, the kids belly up to the island; casual meals take place in a breakfast area just off the kitchen. 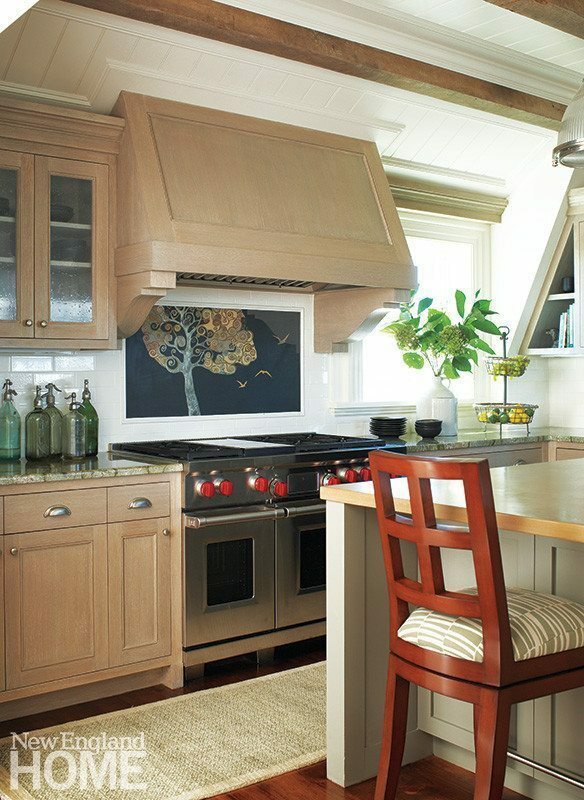 The family spends lots of time in the kitchen, often gathering at the large island with its gleaming mahogany top.